Consisting of Kate Pillsbury, Emilee Petersmark, Ben Zito, and Dan Rickabus, Grand Rapids’ Crane Wives have quickly ascended to the top of their scene’s radar since their 2010 inception. They, alongside bands like The Ragbirds and The Accidentals, have become flagship artists of the state, and deservedly so when one considers the virulent earworms that they’ve been developing since the start of the decade. They came crashing onto the Grand Rapids scene with an eclectic album full of sweeping stories to tell in the form of Safe Ship, Harbored in 2011, complete with the “female-fronted, harmony-driven folk-rock/pop” that they’ve only honed to a masterful degree in the five years since. They’d come to a head with last year’s indelible, PledgeMusic-funded Coyote Stories, and now they’re back it again with sister album Foxlore in 2016. As much as Foxlore remains glued to the hip of Coyote Stories—and beyond the obvious name and artwork, it also has its fair share of similarities as far as thematic overtones go—it also stands as its own entity in due regards to its overall sound. A notable departure from the band was made by banjoist Tom Gunnels in-between the releases of these sister albums, but The Crane Wives deal with the change in lineup honorably. The end result is an album that comes across with a lighter resounding bite and a graceful album that reaches separate, but equal, layers of ethereality compared to their previous efforts. This is seen right out of the proverbial gate with the first minute and five seconds of opener ‘Nothing at All’, coming in as an understated, thoughtful acoustic ensemble before evolving into a more fully-fledged, yet open, track. The band freely experiments with more sounds than they had previously encompassed, like the gypsy jazz vibes emanating from ‘Curses’ and the orchestral light rock of ‘Ribs’, each to an impressively listenable degree. The album culminates with the brooding edge of ‘The Garden’, complete with an infectious case of guitar licks, another strong bassline, and some hefty percussion that help bring the song more of a garage rock flair than any of the band’s previous efforts. It’s undeniable why The Crane Wives are as celebrated as they are in their hometown and state. Foxlore, not unlike sister album Coyote Stories, further showcases the multitude of reasons why their repute as a band on a national and international scale should take a few steps up the metaphorical ladder as time goes on. They’re an impeccable band with incredibly tight instrumentation and harmonies that, paired with an inclination for catchy hooks and scintillating lyricism, make a strong case for their burgeoning popularity. 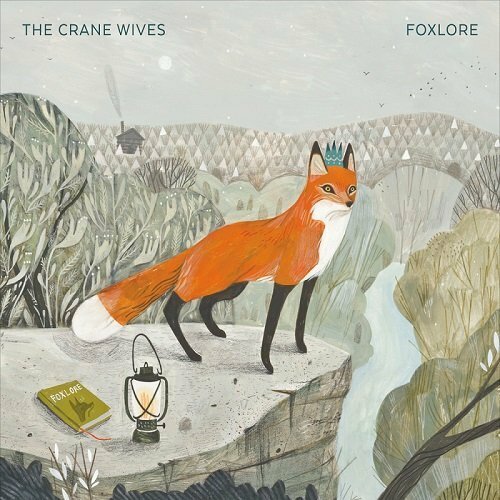 For more info on The Crane Wives, check out their official website.